George Soros is a best-selling author. His fourteen books offer insights into how he approaches investing and business and share his perspectives on politics, economics, globalization, philanthropy, and open societies. The European Union could soon be a thing of the past. Xenophobia is rampant and commonly reflected in elections across the continent. Great Britain may hold a referendum on whether to abandon the union altogether. Spurred by anti-EU sentiments due to the euro crisis, national interests conflict with a shared vision for the future of Europe. Financial Turmoil in Europe and the United States shows George Soros responding in real time to a rippling earthquake of financial instability. In this collection of essays written since the aftermath of the Crash of 2008, he addresses the urgent need for the U.S. to restructure its banking and financial system. Five lectures George Soros delivered at the Central European University in Budapest - which he founded in 1991 - distill a lifetime of thinking on finance, capitalism and open society In a series of lectures delivered at the Central European University in October 2009, George Soros provided a broad overview of his thoughts on economics and politics. The London Times writes: "They're wrong about oil, by George: In short, the standard economic assumption that supply and demand drive prices is only a starting point for understanding financial markets. In boom-bust cycles, the textbook theory is not just slightly inaccurate but totally wrong. This is the main argument made by George Soros in his fascinating book on the credit crunch, "The New Paradigm for Financial Markets," launched at an LSE lecture last night." George Soros made billions anticipating seismic changes in the financial markets and has used that money to try and change the world. In The Age of Fallibility he brings that commitment to the subject that has preoccupied him since 2001: the degenerate state of America. George Soros, a major proponent of globalization, takes to task the many institutions that have failed to keep pace with our global economy. At the same time, he offers a compelling new paradigm to bring the institutions and the economy back into necessary alignment. George Soros combines his razor-sharp sense of economic trends with his passionate advocacy for open societies and decency in world politics to come up with a workable, and severely critical, analysis of the Bush administration's overreaching, militaristic foreign policy. Soros takes a new and provocative look at the arguments he made in "The Crisis of Global Capitalism", incorporating the latest global economic and political developments into his analysis. He shows how our economic and political arrangements are out of sync. Recognizing that our existing institutions are under the sway of sovereign states, he proposes an "open society alliance" with the dual purpose of fostering open societies in individual countries and laying the groundwork for a global open society. Written in 1998, Soros analyzes an earlier global financial crisis and demonstrates how faulty theoretical assumptions combined with human behavior had led to the turmoil. He suggests remedies to the meltdown, based on his years of experience as a financier and philanthropist. Financial guru George Soros is one of the most colorful and intriguing figures in the financial world today. Now in Soros on Soros, readers are given their most intimate and revealing look yet into the life and mind of the one BusinessWeek dubbed, "The Man Who Moves Markets." George Soros has done more for open societies than any other private citizen in the world. In Underwriting Democracy he describes his experiences helping to bring about democratic change in Eastern Europe—experiences that are especially relevant now that our country has begun to intervene (though in an entirely different way than Soros) to create functioning democracies. George Soros compares and contrasts open and closed societies and illustrates the superiority of the open society system. He offers solutions for the then crumbling Soviet Empire to integrate into the free world. In this special edition of the classic investment book, The Alchemy of Finance, George Soros presents a theoretical and practical account of current financial trends and a new paradigm by which to understand the financial market today. This edition's expanded and revised Introduction details Soros's innovative investment practices along with his views of the world and world order. George Soros has been the subject of many fascinating books. Here are some of them. George Soros is one of the world’s leading philanthropists. 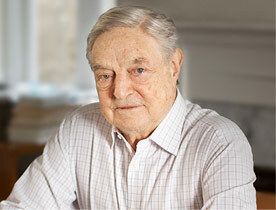 Over the past thirty years, he has provided more than $8 billion to his worldwide network of foundations: the Open Society Foundations, which have applied the concept of the open society, the cornerstone of Soros’s thinking on democracy, freedom, and human rights, in the United States and abroad. This book, written by former New York Times journalist Chuck Sudetic, marks the first exploration of George Soros’s innovative philanthropic strategies and unmatched commitment to building open societies in places where dictatorship and violent repression have been the rule for too long. As a financial genius, global philanthropist, political activist, man of conscience, and the world's only investor with his own foreign policy--it cannot be denied that Soros is an enigmatic man of enormous influence. For more than four decades he has been so successful that he has been accused of directing the course of global markets and shaping the destinies of nations.